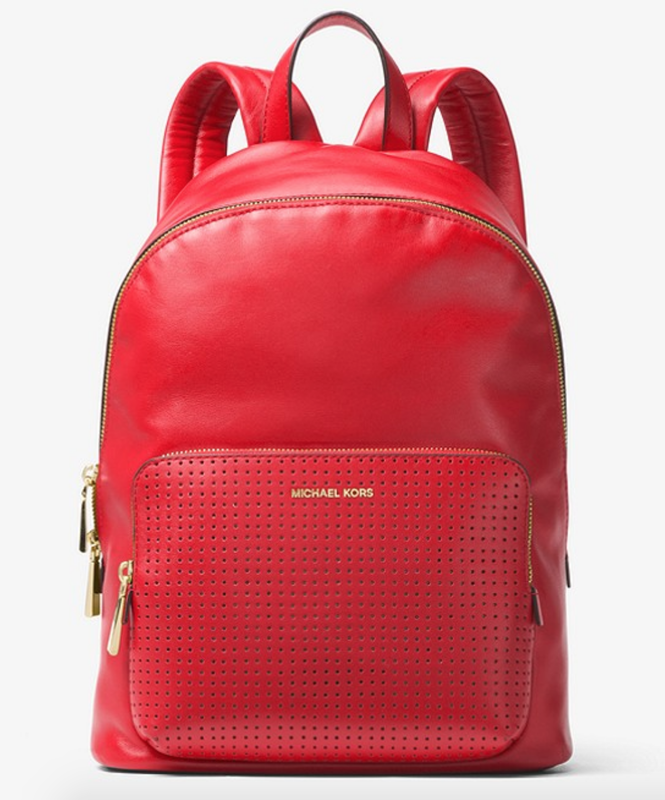 Lately I am also into backpacks, mini, medium or bigger too. A street-style staple, the Wythe backpack is designed to make a statement this season. Its polished leather construction features a perforated front pocket that’s perfect for showcasing our interchangeable pins. Exclusively Ours in Michael Kors stores and on Michaelkors.com until 8/31/18. And lets see if people actually like this model. This is such a nice backpack handbag, high quality leather, love the roominess of the bag and the compartment and side zipper where you can put your valuables. 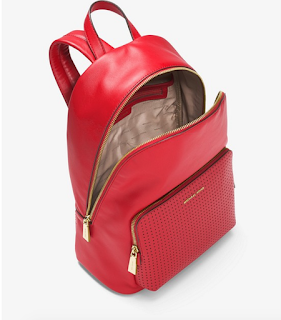 The color is this fire red engine that will brighten up your outfit! I can't believe I have you. it took me sometimes on how will I get you and I did. I'm very proud and happy. At last, your mine. 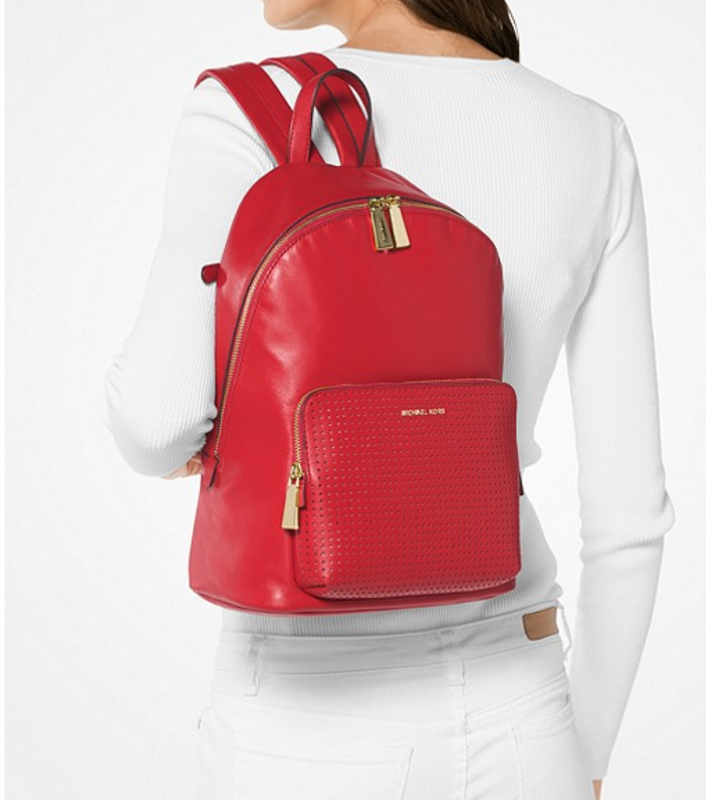 Backpack has minimalist style, good for everyday use. I purchased in black and I just love everything about it. Getting the straps adjusted right makes it perfect! So happy with it!! I love my leather backpack. I use it for a purse and the thick straps are great! Love the zipper in the back!!!! I love that I can use this backpack to store waterbottles, snacks, keys and all the essentials and still look cute doing it! Love love love the secret side compartment for easy access. I just love my backpack and I got lots of compliments. It’s very beautiful! It’s look great, really comfortable. Perfect size. I bought online , it comes with some small scratches on the side surface leather, other than that, I like the style and space as modern packback. Trust the brand and loyalty customer. This is an amazing design- beautiful leather, and the perforation is an amazing feature that allows some flair without damaging the leather. however, another reviewer mentioned it would probably fit a 13" laptop and it does not. Would need another inch maybe, as well as a zipper further back that opens over the tech pocket, like their rhea backpack. This style overall is really spot on though and top quality, so I will be watching for an updated model! I bought this for overnight stays, has more than enough room for everything! The backpack is super, really stylish! The perforated front allows you to add your touch to it. The reason I'm giving it 4 stars as opposed to 5 is this: the description says it'll fit most laptops, but mine (a 15 inch, which is the size of most laptops) only goes in if I put it in without a case, and I have to tilt it diagonally so that the bottom lays near the front of the bag, while the top lays near the back, and even then it deforms the upper part of the backpack (which is bad for the leather). So, no, it doesn't fit most laptops, but it'll fit your laptops that are like 13 inches or smaller. 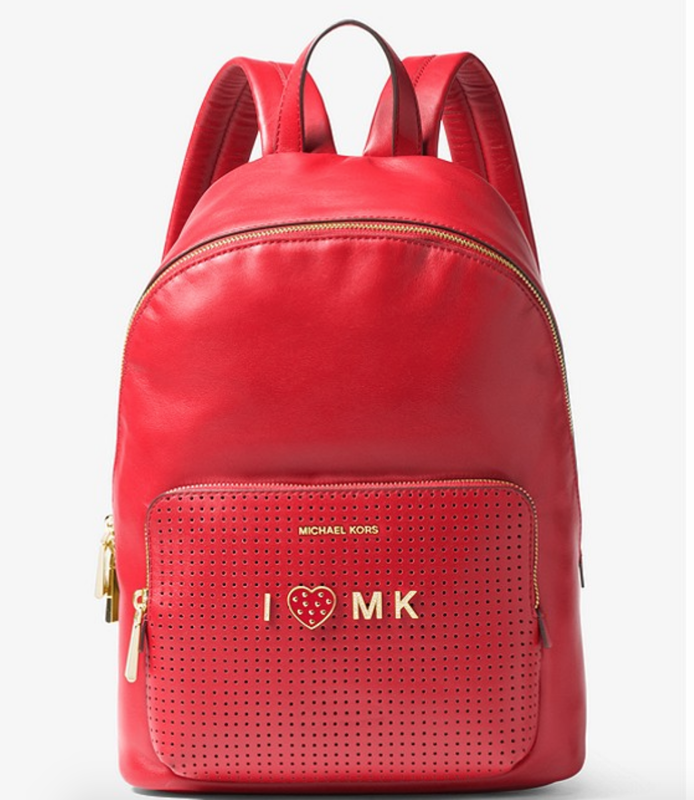 Still very happy with my purchase, and I'd recommend it to others while taking care to let them know that the MK description misrepresents the backpack. I bright my backpack about a month ago. And I love it.. I love how it feels.. soft leather comfortable for your shoulders and back. Would you buy it? Let me know in comments!!! Odwiedź na Pintereście profil użytkownika Megan. All rights reserved. Travel theme. Powered by Blogger.